For Christmas the lovely Mr TM bought me a book token, for a HUGE sum of money as he cunningly remembered how I cannot walk into a bookshop without needing all the books. So a couple of weeks ago we went out into the cold and wandered into the warm and cosy land of the book shop. A proper bookshop with tables of enticing new reads, an upstairs with a coffee shop, with carpet in all book sections and randomly spaced comfy leather sofas, the sort of shop that wants to envelope you and keep you until you are one with it. 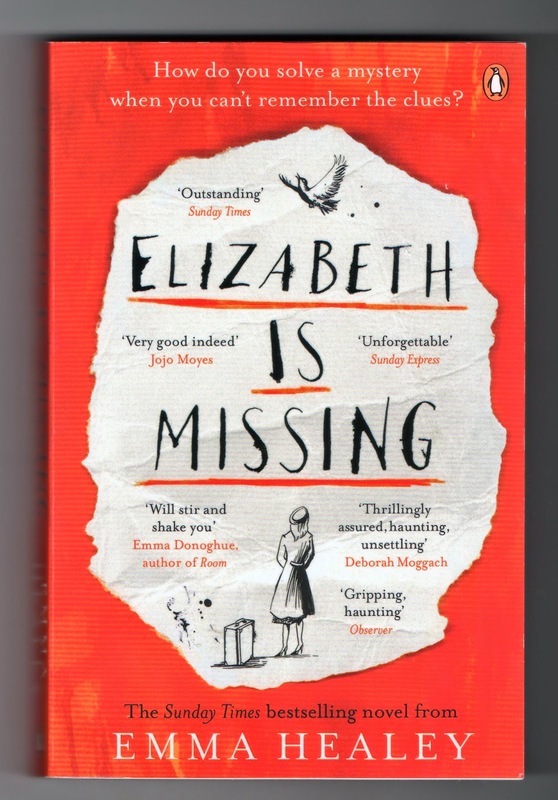 I had asked twitter for some book suggestions and had been recommended 'The Unlikely Pilgrimage of Harold Fry' by Rachel Joyce, and while looking through the H-K section in hope I stumbled on a rather interestingly covered book, 'Elizabeth is Missing' by Emma Healey. The cover looked fascinating, a scrap of paper, a drawing and some rather good reviews...I turned the book in my hands. I knew I needed it when I saw it was about a woman called Maud, what a super old lady name. Maud has dementia, maybe Alzheimers, she is not stupid but she struggles to keep pieces of her life in order, to keep words together, to remember things. She leaves notes but what do they mean? And is the note about not cooking really for her? Who keeps buying tinned peaches? One note says that Elizabeth is missing. Maud is convinced of this one fact and no one, not her daughter, not the police, will make her give up her search. The book twists through Maud's days, entwining her past with her present, sometimes even the reader cannot see what is real, what is remembered, what is dreamed. But Maud is a stubborn old bird, she will get to the bottom of the mystery, she will find out what has happened to Elizabeth, and we are swept along with her to the end. The book is harrowing at times, I had a neighbour very like Maud, who would pop round to tell us the same thing each day and at all hours, who would forget who we were, or forget she lived next door to us when she had left her driveway, the portrayal of Maud in this book was terribly accurate, heartbreakingly poignant. And the writing..I was caught by the brilliance of the style and the phrasing in this book, often more poetry than prose in it's clever use of imagery. I leave you with one of my favourite bits from the book. "A bang, somewhere in the house , makes my eyes skitter across the sitting room, there's an animal, and animal for wearing outside, lying over the arm of the settee. Its' Carla's. She never hangs it up, worried she'll forget it, I expect. I can't help staring at it, sure it will move, scurry away to a corner, or eat me up and take my place. And Katy will have to remark on it's big eyes, it's big teeth. The front door clicks shut and I hear Carla locking it after her. Locking me in. I watch her through the window as she crunches across my path. She wears a coat with a fur-edged hood over her uniform. A carer in wolf's clothing." Oh, and I bought 'The Unlikely Pilgrimage of Harold Fry' by Rachel Joyce too - next to read and review!